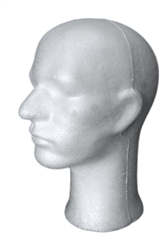 This male display head is constructed in plastic with a white finish. He will make for a simple display of your retail products including: sunglasses, scarves, hats, caps, helmets and masks. Height from Top to Bottom - 16"